What does it mean to have Jupiter in Gemini? Let us find out about Jupiter in Gemini luck, career, love and more. As an air sign, Gemini is all about mental stimulation. 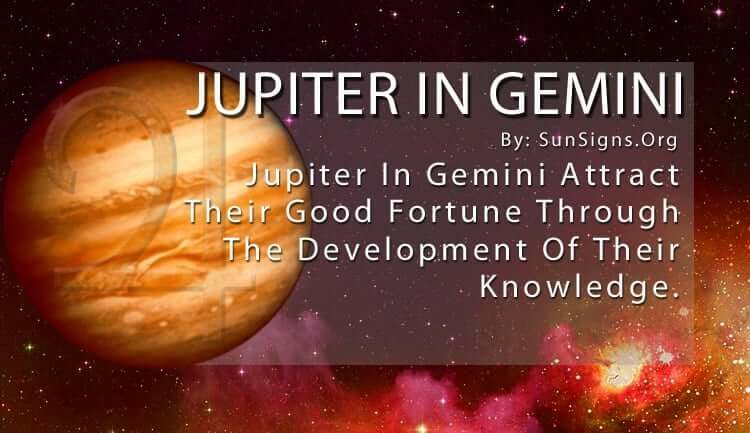 And Jupiter in Gemini attracts their good fortune through the development of their knowledge. Because they can be a bit irrational, they rely on their social skills and automatic curiosity to bring good luck into their life. The expansion is key. Gemini’s optimistic nature comes out most with Jupiter in Gemini. Jupiter is all about luck, good fortune, our values, travel. Those with Jupiter in Gemini use their wit and zest for life to maintain a positive attitude. It’s this attitude that attracts good vibes and plenty of opportunities. Fortunately, Gemini needs other people to survive as social creatures. And, this helps to bring them back to reality every time. Be extra patient with your Jupiter in Gemini husband or wife. It will take them a while to get out of their head and into someone else’s shoes. But once you have their attention they will transfer their happy thoughts and feelings to you, often leaving you giddy for more. What does it mean when Jupiter is in Gemini? They are always on the lookout for ways to discover new possibilities and acquire more knowledge. This often opens doors they wouldn’t have known were available otherwise. And this kind of endless searching is magnified with Jupiter in Gemini. Travel is often a big part of finding favorable chances that offer you great rewards in life. But their intellect and gift for conversation can get them out of many jams, and Jupiter in Gemini love to talk! They may not be incredibly knowledgeable about every subject they discuss. But, they know enough about a variety of topics to get by in any debate. The Jupiter in Gemini natal chart shows they have to be careful in choosing which risks to take. They usually want to accept all of them! They feel they are always up to the challenge. But, they can overburden themselves with too many projects. This causes them to be flighty at times. And they have so much energy they rarely back down from a good argument! This can get them into trouble sometimes with their sharp tongue. But it also illustrates their passion for learning and giving their knowledge to others. But they will have to slow down once in a while and focus on other people. Or else, they could lose one or two of their inner circle. The Gemini Jupiter people often run the risk of spreading their time and efforts on others too thin, leaving their loved ones to feel left out of their lives. The Jupiter in Gemini value the spread of information throughout society and join in the cause when they can. Because of their quest for wisdom, they always have interesting stories and obscure facts to share. That helps to keep them surrounded by good friends and a loving family. This keeps them content, which helps them to lead very fulfilling lives. This is the wonder and merriment that this Gemini brings with them wherever they go. And, they are always up for a new adventure. And Jupiter in Gemini keeps that energy going as they explore other worlds and cultures. Expanding their horizons is extremely important to them. Independence is their number one priority. This means as long as they’re free they’re happy. If you stay out of the Gemini’s way, they will take you places you never knew existed.